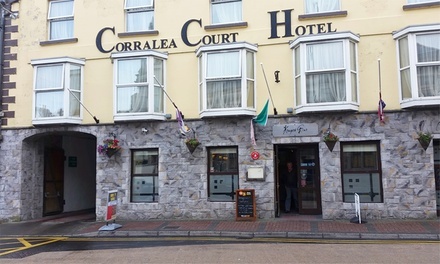 Occupying a prime spot near Tuam’s town square and a 3-minute walk from the Cathedral of the Assumption, Corralea Court Hotel offers an ideal base for exploring the local area. Guests can take leisurely walks along the historic streets of Tuam and soak in the slow-paced atmosphere of the place. Holidaymakers unwind in cosy bedrooms equipped with en suite bathrooms, TVs, tea- and coffee-making facilities and hairdryers. Evenings may be spent at the bar with some live music entertainment while hearty meals based on local ingredients are served at the on-site restaurant. Replete with ancient vestiges and nature beauties, Co. Galway allures travellers to delve into the vastness and variety of its landscape. It mixes the mildness of the coastal area with the roughness of the landlocked territory in a setting which is home to Ireland’s largest lake, Lough Corrib. Steeped between the Na Beanna Beola, which is home to the highest peak in the country (Benbaun), Sliabh Echtghe and the coastal region, highlights such as the late medieval Dunguaire and Aughnanure castles, the derelict but now highly popular Glengowla Mines and the 6th-century Clonfert Cathedral reminisce of the county’s past. The puzzling rock formations of the Burren and the Cliffs of Moher add up, but globetrotters should also consider visiting the Inchagoill Island and the Aran Islands in order to get a complete view of the county’s historical and nature assets. Cancellation Policy: No modification or cancellation allowed after booking confirmation. Bookings are non-refundable and non-transferable to another destination once confirmed. Validity: Valid until 31 Aug 2019. Excluded dates/periods: 18-21 Apr and 3-5 May 2019, Supplement of €15 per night applies for Friday and Saturday nights, payable directly to reception upon arrival. Price for 2 people. Booking: Must book within one month of the voucher purchase. Booking required by phone: 09324188 or by email: [email protected], and subject to availability. Please attach your voucher to the e-mail. Limit 1 voucher per stay. Limitations: Must be 18 or older with a valid ID for alcohol. Other Information: The hotel is located in Tuam, Galway, Ireland. No city tax. No transfers included. Valid for stay in a double room for 2 people (max. occupancy). Breakfast is included on all mornings of stay. Dinner will be provided on one night of stay and will be two courses only – main course up to €14.95, supplements may be payable for certain menu items. Vouchers sold by Groupon International Travel GmbH. iDiscount Ireland, Proudly powered by WordPress.